It was a ride, not a race, but had chip timing and medals were on the line. We turned up bright and early on a windy day to ride bikes and raise money for the National MS Society, Greater New England Chapter/Team Spinal Tap. 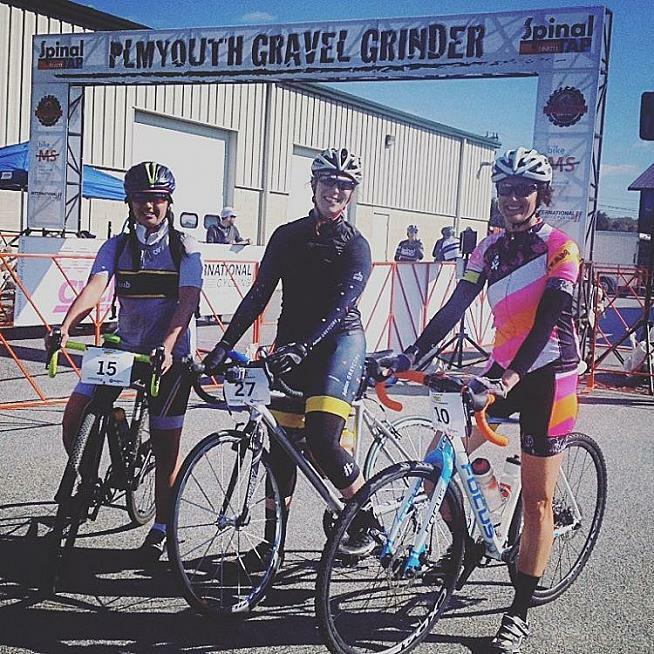 The start/finish of the Plymouth Gravel Grinder was Independent Fermentation. While 8:00 a.m. was a bit early for a pint, I made note while standing in line at registration to try their Rye and Sage Saison once I was finished. Since we were chip timed, there wasn't a huge mass start of all 57 riders, although I did start in a group including my friends Dana from Ashton-Greycork and Alex from Steve the Bike Guy/Team Betty. Did I finish in a group? Well... spoiler alert: no. On your mark get set go whenever. Credit: Alex Carleton. 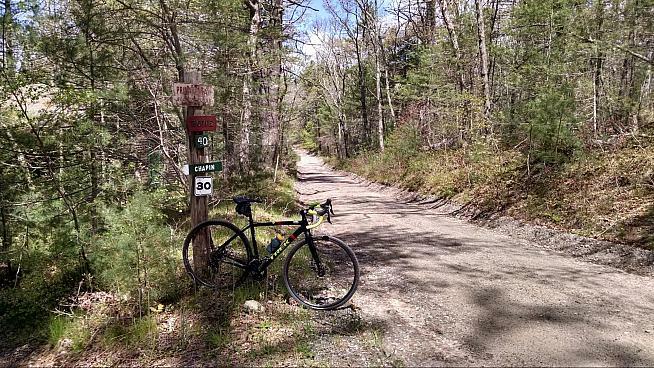 The gravel sectors counted down from 12 to 1 with paved roads connecting them into a 55 mile loop. In Sector 1, Alex dropped one of her bottles and debated about going back for it, which I advised her to do since the only rest stop was close to the end of the ride. 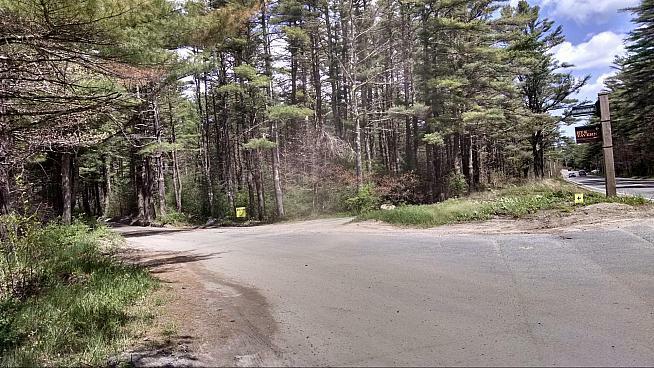 On the curvy roads through Myles Standish State Park, I lost the group, then passed them through the bumpy sector 3, a residential area overlooking a pond. I played a series of leapfrog games through the windy, rolling sectors, occasionally pulling along a wheelsucker or two before they'd bolt off, literally leaving me in the dust once I went back to recovery pace. I didn't really care. I just wanted to see how hard I could go on my own and how far. Inevitably, my legs decided they didn't want to play the leapfrog game anymore. Thus, I did the remainder of the ride alone, which was fine since then I didn't feel too bad about stopping to take pictures or eat an occasional tube of applesauce. It’s always good to look back at where you came from to understand where you’re going… or something. Credit: The author. The route looped in and around Plymouth, mostly in wooded conservation areas and around ponds, crossing Route 3 a couple of times. There was a particularly lovely stretch along the ocean, but for the most part, I felt like I had disappeared into the trees like an elf in Tolkien's Middle Earth. All the same, I wasn't exactly in terra incognita due to the signage and my GPS. Especially with how windy it was and how I burned all my matches, I didn't feel like I could afford energy expenditures on detours. I suppose Seneca's "ignoranti quem portum petat nullus suus ventus est/when one doesn't know for which port to sail, no wind is favorable" holds literally true, although I knew where I was going and the headwind still felt most unfavorable. The dirt roads were fairly smooth and easy for the most part, at least until the later sectors that had washboard-like indentations that appeared to be from some sort of continuous-track heavy equipment vehicle. Sadly, I couldn't identify the vehicle from its tracks, but I imagine it was quite large. I can almost still feel the shuddering in my joints from bouncing all over the place, while trying to maintain a predictable line. There was even a sector that had a couple hundred yards of dirt followed by a couple hundred yards of pavement, alternating through a couple of times just to keep you on your toes, or more accurately, out of your saddle. The route was well-marked with yellow arrows and signs especially the sign for the Rye Brewery about 6 miles from the end. Credit: The author. Cars were present on the roads and on some of the dirt roads, but they seemed few and far between. I may have actually encountered more people out for walks and other cyclists than cars. However, since I was pretty far off the back, I didn't really see much of anyone other than one guy who passed me on the washboard and my friend Joanna, who caught up to me after being about two minutes back early in the ride. Around mile 45 I got to some picturesque farmland and I had to slow down due to horse crossings. 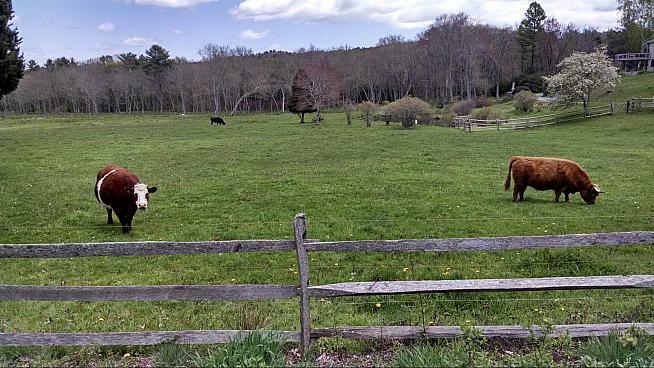 Also, I had to stop and take a picture of some placid-looking cows in a field. Since I was off the back I figured I had time to stop and make some friends. Credit: The author. Soon enough, I had passed through Sector 1 and I recognized the industrial parks I passed through on the way out and found myself back at Independent Fermentation, albeit a bit perplexed about which direction I was supposed to go through the start/finish truss. Eventually I went through and heard the beep letting me know that my chip was read and my time was marked. I did a spin around the parking lot to cool down my legs and immediately got in line for pizza from Tom's Wood Fired Pizza, also a fond mainstay at the Plymouth Festival of Cyclocross. However, I had to briefly hop out of the pizza line to pick up a bronze medal. This was much to my surprise since I was probably 20 minutes behind everyone else, but someone said the other person in my age group got lost along the way. At any rate, as far as I was knew, this was a ride, so receiving any sort of award was a pleasant surprise. I settled in with my small pie (riders got a free small cheese pizza but could throw in some extra dough for toppings, I opted for the spinach and pepperoni for a more balanced meal) and pint (of Rye and Sage Saison that I had promised myself earlier). After 55 miles, I definitely needed that along with the glass of water that a lady behind the IndieFerm counter almost precognitively handed me before I even asked for the beer. Our after-after-race celebration was ice cream at local institution Farfar's (per Alex's suggestion, as she had married into the ice cream dynasty) in Duxbury. Imagine everything wonderful about New England ice cream: soft, creamy hand-scooped goodness served by a smiling teenager at a shop that's been in the family for multiple generations. There are pictures hanging on the walls of each "graduating class" of student staff along with college pennants (many Ivy League since those kids are wicked smart, as it were). Overall, this Plymouth adventure had a bit of everything: group riding, solo riding, pavement, dirt, bumpy dirt with rocks, pizza, beer and ice cream. It was everything a summer adventure should be, even with 15-22 mph wind speed and the temperature never rising above 60°F.